Demolishing a building is a big, messy pain in the neck. Dynamite is loud and dangerous. Wrecking balls are heavy and dangerous. Why not just get a robot to do the work? 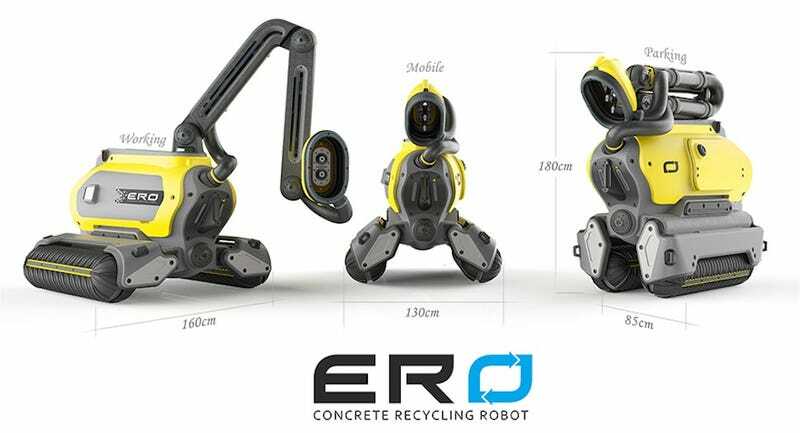 That's exactly what Omer Haciomeroglu was thinking when he designed the ERO Concrete Recycling robot, one of the winners of IDSA's International Design Excellence awards. This Transformer-like device is capable not only of breaking down concrete on the spot but also of pumping out the raw materials and packaging them for reuse. The ERO works in fleets to take down buildings wall-by-wall. And it's all remarkably clean, especially compared to most dust cloud-laden demolition techniques. The process is pretty simple. The ERO goes to work on a concrete surface with a high-pressure water jet that cracks and breaks down the concrete itself. The robot then gobbles up the waste solid waste, a mixture of aggregate and cement, and sends it into big bags that can be stored and used for new construction. The water itself is recycled as are the steel reinforcement bars inside of the concrete walls. This is all terribly efficient compared to traditional methods that depend on fossil fuels to power all kinds of machinery and recycle pretty much nothing. And just for the record, the ERO itself is actually pretty, especially when it's working.